This Baked Tender Chicken Thighs Recipe is going to become a hit! Tender and melt in your mouth juicy chicken thighs with an easy seasoning is filled with so much flavor. 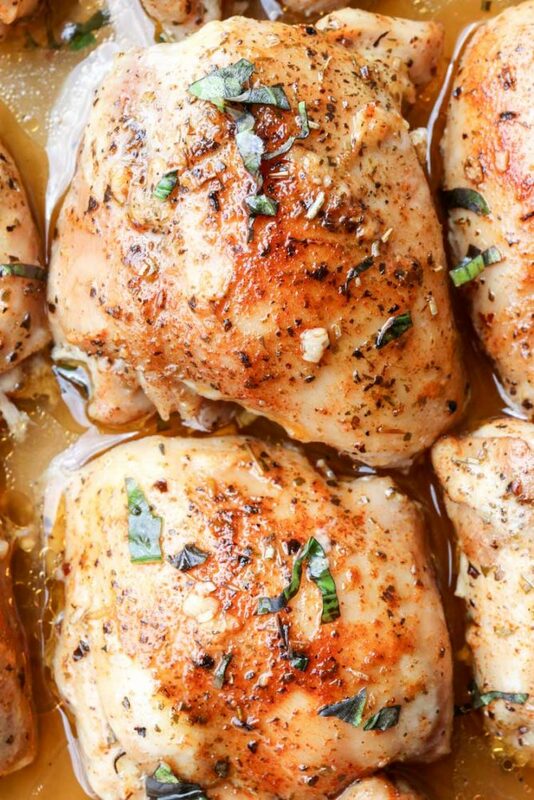 Serve thighs with a side of mashed potatoes and salad. This recipe with our Easy Baked Chicken is our go-to meal for busy evenings. There are so many different methods for cooking chicken thighs. This recipe for baked chicken is going to become a favorite. The prep time is minimal and the ingredients for the thighs are already most likely in your pantry. The marinade for the thighs penetrates deep into the chicken and it becomes so juicy and flavorful. The garlic olive oil with quick seasoning does wonders to the chicken thighs! Trim and remove any excess far from chicken thighs. For best result, season the chicken thighs, cover tightly and refrigerate for at least two hours (up to overnight). The seasoning penetrates deep into the chicken and becomes flavorful. If you don’t have two hours, baking the chicken immediately is fine as well, just won’t be as flavorful. If you like to prep dinner in the morning, this is a great recipe. Season the chicken, cover tightly and keep stored in the refrigerator. When you come home from a long day of work, all you have to do is bake the chicken. So easy. Leftovers are wonderful to use in different recipes that require cooked chicken (like the Chicken Quesadilla recipe). 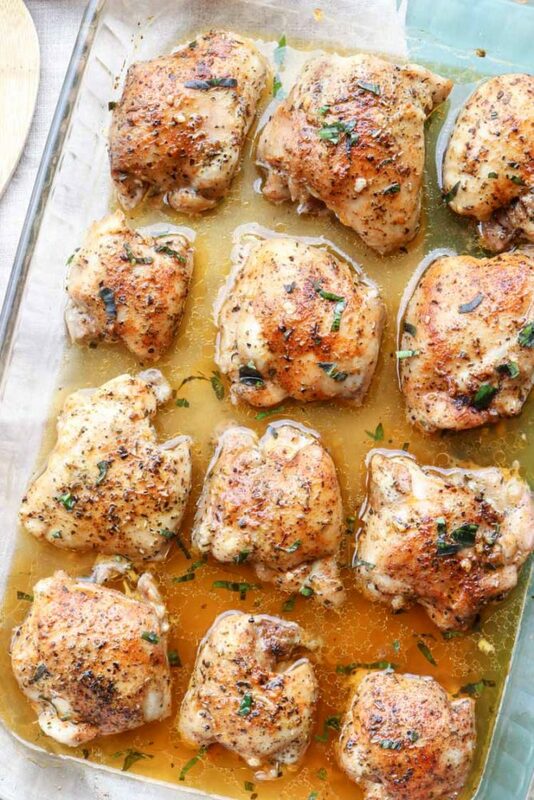 what can I serve with baked chicken thighs? You can serve baked chicken thighs with mashed potatoes, pasta, fried or baked rice, or even buckwheat. A salad, would of course compliment the dinner with some homemade bread (like this amazing bread machine bread). can I substitute the thighs? CHICKEN BREAST- You may substitute the chicken thighs for chicken breast. However, the flavor and texture will slightly change because chicken thighs have a stronger flavor, higher fat content and softer texture once baked than chicken breast. Depending on the size of the breast, the baking time will vary and most likely be less than the indicated time in this recipe. Use a food thermometer to cook breast until the thickest part registers at 165°F. BONE-IN THIGHS- You most definitely may substitute for bone-in chicken thighs. The bone keeps the thighs juicier and even adds flavor. The only setback with bone-in thighs is the baking time will be longer. Keep the dish cover with foil for one-half of the cooking time plus an extra ten minutes. Then, remove the foil and allow the chicken to brown during the second half of cooking. Chicken Mushroom Pasta– in the creamiest sauce. Chicken Stuffed Shells– in homemade Alfredo sauce. Chicken Shrimp Scampi– the perfect combination. 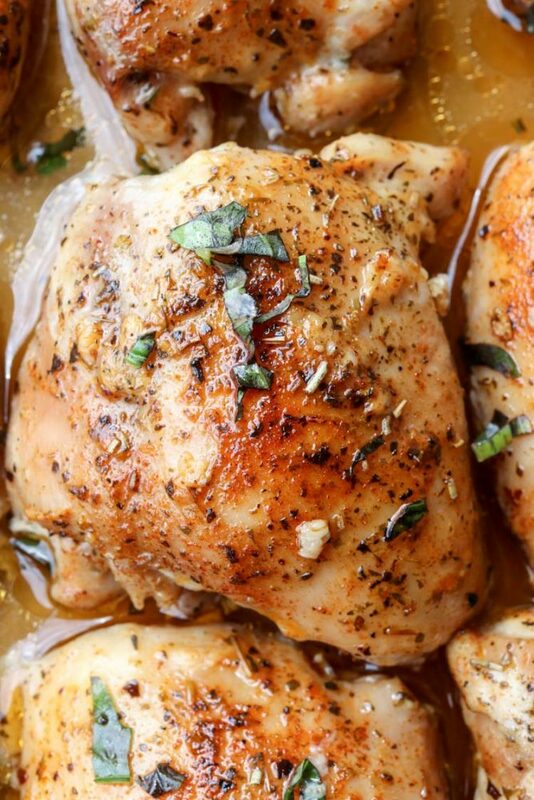 Easy, juicy and the most tender oven baked chicken thighs recipe. With 10 minutes in prep time and an easy oil, garlic rub with a delicious seasoning, these chicken thighs will become a family favorite. In a bowl, combine olive oil and minced garlic. Layout chicken thighs and coat with oil mixture (on both sides). Prepare the seasoning: In a bowl, combine the salt, pepper, Italian seasoning and paprika. Season boat sides of chicken with the seasoning. Transfer chicken thighs to a baking dish. Cover with foil. Set aside to marinate at least 2 hours (*or see note). Bake 45 minutes at 375°F. Remove foil and broil for 8-10 minutes (at same temp), until tops of thighs are crispy. Note: Marinading at least 2 hours will give best results. If you don't have two hours, still bake the chicken it will still be great. This dish was AMAZING! I’ve never been able to bake chicken and have it come out juicy. My kids also loved it and asked when I would make it again. Thank you for sharing this recipe! I had this for dinner tonight. So delicious! I will definitely be making this again. Curious if anyone has tried putting this together and freezing (raw) for future use? Thank you, Nicole. So glad you enjoyed the easy baked chicken recipe. 🙂 Stop by and visit our online home again. I just love this recipe! Thank you for sharing! Even my picky kids eat it!!! That’s high praise!! I have a small stove. The broiler compartment is under the oven, like the old broilers where it slides out, and there isn’t room in the broiler for a casserole dish. What do I do for the last ten minutes I’d i don’t have access to a broiler? Hi, Xochitl. You can just bake an extra 5 minutes or so until the chicken is desired crispiness. 🙂 That’s all the broiling will do. Enjoy the dish..
Definitely my type of recipe. Baked chicken tenders always turn out so juicy and delicious! Do you tuck in the edges of the chicken or are they layed out completely flat? I’ll add that to the notes. Yes, you just tuck the edges under. Thanks for catching that, Lena. I hope you love the thighs recipe. LuzMaria. Huge welcome to our online home from all 8 of us (that’s including our 6 kiddos, haha). This was the absolute best boneless skinless chicken thigh recipe ever! I did marinate these over night probably a little less than 16 hours. When it came time to take off the foil for the broiling part, it worked best at 425° for 10 minutes. My broiler only would go to 400° minimum, I think the rack may sit a little far from the broiler. Thank you so much for this delicious recipe. Hi, Nancy. The prep time is 10 minutes, rest time (marinade) is 2 hours, bake time is 55 minutes and all combine is 3 hrs 5 minutes. Hope that helps. Enjoyed. Excellent flavor! I let them marinate about 4 hours and they were tender and delicious – very flavorful! However, 45 minutes at 375° is way too long. I put them in the oven straight from the fridge and the thighs were up to 190° after just 30 minutes. Other than that, this recipe is overall excellent. Really good recipe. Used bone in as usually maintains moisture better for me. Also reduced fat leftover in baking dish with some water then added some flour to make a very tasty gravy to top the chicken off. Thanks so much for the feedback, TB! It’s so appreciated:)! Delicious! My teens loved it and said they’d rather have this recipe for Thanksgiving instead of traditional turkey! I served by today with roasted sweet potatoes and salad! So easy to prep and I all ingredients on hand! Thank you! Made this last night for my husband and kids, they loved it. Easily modified the measurements because I had less chicken thighs than the recipe called for. I trimmed the fat from the chicken thighs as mentioned in the recipe and then decided to put it back in with the chicken to cook. The added fat worked great. Thanks! Glad you enjoyed the recipe, Barbara. I hope you come back and visit our online home. This turned out delicious and beautiful! Followed exactly! Will put in my winner file! My bf loved it too! Served with garlic mashed potatoes and corn on the cob! Thank you! You had me at garlic mashed potatoes and corn on the cob, Pam. Sounds like a wonderful dinner. Thanks for sharing the wonderful review. Made this to the recipe – love it. Can it be marinated and then bake in a slow cooker? Hi, Norma! I’m so glad you enjoyed this recipe. I’ve never made this is a slow cooker so I’m not sure how it would turn out. Sorry, that wasn’t very helpful. Did them on the grill…even better! Valentina…the image looks like bone-in thighs…just want to confirm you used “boneless.” Thanks! Yes, boneless thighs, Connie. 🙂 Enjoy..
Hello. Thanks for great chicken recipes! Can you tell me what font you used for “Valentina’s”. It’s perfect for my new business logo- have been searching for this look. I’d really appreciate knowledge where to find it. The flavor was good but the thighs were outrageously overcooked. Maybe half the recommended time…..